Shift covers are a way for team members to swap shifts with each other. Someone requests a shift cover. You approve or deny the request. If approved, team members are notified about the available shift. A team member picks up the shift and the shift is reassigned. The shift cover is complete. 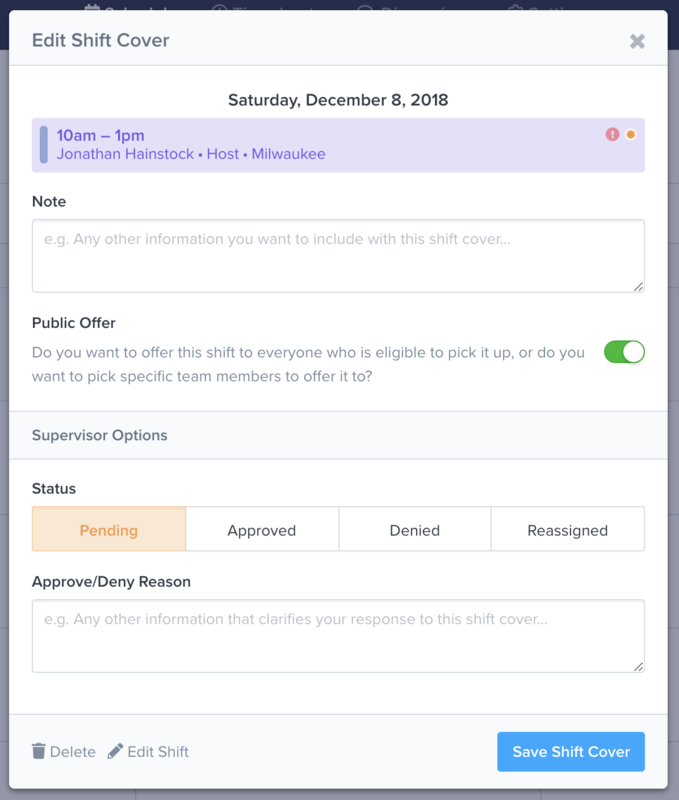 Shift covers requests are indicated by a purple background. You can respond to shift cover requests from the Schedule => Team Schedule and Shift Covers pages. To respond to or edit a shift cover, click on the shift, and click the Shift Cover button. Public Offer By default, everyone who is assigned to the shift's position and location will be able to pick up the shift. You can edit the list of people who can pick up the shift by toggling off the Public option and selecting specific team members. Status Respond to the request by updating the status to Approved, Denied, or Reassigned. Shift covers submitted by supervisors are automatically approved. You can allow shift cover requests from all team members to be approved automatically from the Settings => Schedule Settings => Shift Covers page. Whoever picks up the shift first receives the shift. The person who requested the cover is still on the hook until someone picks up the shift. Once the shift has been picked up, notifications are sent to the person requesting the shift cover and the person who picked up the shift.